Down the centuries the Consistory for the creation of Cardinals has developed a particularly rich ceremonial form. In previous centuries the creation of Cardinals took place in a secret Consistory at which the Pope would announce the new cardinals’ names. Straight after the Consistory the new cardinals resident in Rome would be notified of their nomination by means of the “biglietto” — which in 1879 prompted Bl. Cardinal Newman to give his famous discourse. That same day in the afternoon they would go to the Apostolic Palace to receive the red biretta from the Holy Father. Should a new cardinal who lived outside the city be unable to come to Rome, he would receive the biretta from the Pope through a special delegate. In such cases, he would have to promise to go to Rome within a year to receive his red hat and title in person from the Pope. The subsequent Public Consistory would usually take place in St Peter’s Basilica but occasionally in the Sistine Chapel or in the Consistory Hall of the Apostolic Palace. Among the most moving moments in the ceremony would be the mention of the new cardinals’ act of obedience to the Pope, the imposition of the red hat (“galero”) and their prostration during the singing of the Te Deum, their heads completely covered by their hoods. This was followed by the special rite of the aperitio oris (“opening of the mouth”), since, in the act of conferring the red biretta, the Holy Father had recommended to the new cardinals that they be shrewd and cautious in the use of words occlusio oris (“closing of the mouth”). The ceremony ended after the Pope had given a sapphire ring to each cardinal and assigned to him a titular church or deaconry. After the Second Vatican Council the rites for the creation of new Cardinals, while preserving the essential elements, acquired a more modest, simplified form in comparison with the earlier rites. Indeed, although a distinction was no longer made between the public and secret Consistories, the oath, the imposition of the biretta (instead of the hat) and the designation of the title or deaconry were retained. However, the conferral of the cardinal’s ring took place at the Holy Mass that the Pope concelebrated with the new cardinals the day after the Consistory. Paul VI used the revised text of the Rito (cf. Notitiae 5 , 289-291) for the first time at the Consistory in June 1969. As Annibale Bugnini remarked, the wish to insert into a liturgical rite what in itself was not part of the liturgy was the guiding criterion for the elaboration of the new ritual. The intention was to give the Consistory a celebratory form but at the same time to avoid any element that might give the impression of a new ‘sacred order’ or a ‘sacrament of the cardinalate’ (La Riforma liturgica 1948-1975,CLV — Ed. Liturgiche, Rome 1983, p. 789, n. 15). Nevertheless the Consistory subsequently underwent further modifications which have brought it closer to being a true and proper Liturgy of the Word. As Benedict XVI himself recalled, the Consistory “is an event that always inspires special emotion, not only in those who are admitted to the College of Cardinals with these rites but also throughout the Church, gladdened by this eloquent sign of Catholic unity. The ceremony's structure stresses the value of the task the new Cardinals are required to carry out in close cooperation with the Successor of Peter. It also invites the People of God to pray that in their service these Brothers of ours may remain ever faithful to Christ, if need be to the point of giving their lives, and that they may allow themselves to be guided by his Gospel” (Homily at the Ordinary Public Consistory, 24 November 2007). In this regard and to emphasize the two aspects that must characterize the event — the new responsibility assumed by the cardinals and the context of prayer — after a few variations made in the practices of the most recent Consistories it was deemed appropriate to add a few small modifications which have recently been approved by the Holy Father. First of all, since it is not a true and proper liturgical celebration the Holy Father wears choir dress (with a mozzetta and stole). Then at the beginning of the rite he pauses for a moment in silent prayer at the Confessio, above the tomb of St Peter. For the two prayers at the beginning and end of the rite, the texts of 1969 that come from the great Roman euchological tradition have been used. These are texts of the Mass, on the occasion of the anniversary of the Bishop of Rome’s episcopal ordination, taken from the Veronense (the so-called “Sacramentarium Leonianum”). These orations speak explicitly of the powers entrusted to the Church, especially the power entrusted to Peter. Whereas in the initial prayer the Pope also prays directly for himself, as a successor of the Apostle, to carry out his office well, in the conclusive prayer the Pope invokes God’s blessings on the new cardinals. The proclamation of the Word of God resumes the shorter form, like the rite of 1969, with the single Gospel passage (Mark 10:32-45). One Reading and the Psalm are omitted. 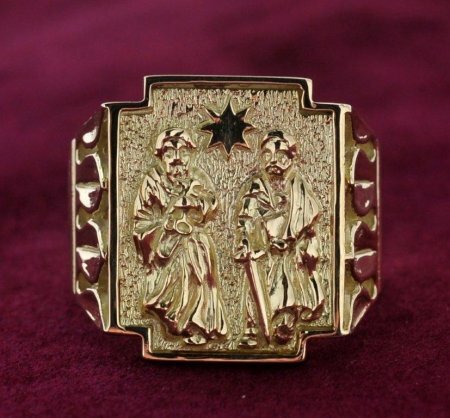 The cardinalatial ring is conferred on the new cardinal, together with the biretta and the title or deaconry, during the Consistory and no longer at Holy Mass the following day. The Consistory is consequently a celebration of thanksgiving to the Lord for the gift of the new cardinals to the Church and “an especially important and suitable opportunity to reaffirm our unity in Christ and to renew our common desire to serve him with total generosity” (Benedict XVI, Homily at the Ordinary Public Consistory, 24 November 2007). At the beginning of the Mass the first of the new cardinals addresses a word of thanks to the Holy Father on behalf of them all. In the previous rite this greeting took place at the beginning of the Consistory.